Having won a competition to develop a 5-ton truck for NATO in 1956-64 years, the Daimler-Benz produced in Gaggenau 8283 trucks of LG315/46 (4x4) model, which became the combination of the L4500A of wartime and postwar LA315. This army model has kept the traditional rounded hood, fenders and all-metal cab with a hatch in the roof, but after 1958 almost all trucks were produced with flat wings and open cabin. The LG315/46 was equipped with multi-fuel OM315 (8.3 liter, 145 hp) engine, 6-speed manual transmission, steering booster, dual braking system and all single wheels. On the chassis of these trucks different bodies, firefighting equipment, cranes and wrecker equipment were installed. 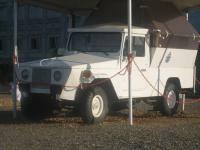 These were the last special army trucks of Mercedes-Benz company. It took almost half a century before the company returned to them.